Antique Clichy. Six spaced rondelles composed of circlets of complex canes each surrounding a central cane on a clear ground. The central motif contains nine pink rose canes. Complex canes include edelweiss, florets, bundled rod and pastry mold canes. Antique Clichy. Six rondelles composed of circlets of complex canes each surrounding a central complex cane on white upset muslin. The complex canes include florets, cogs and pastry mold canes. Diameter 2 5/8". Antique Clichy. Spaced concentric millefiori on clear ground. Central pink rose cane and 18 other separate canes. Antique Clichy. Open concentric millefiori on clear ground. Central star cane surrounded by blue/pink pastry mold canes with bundled rod centers, outside ring of alternating single pink and double green/pink pastry mold canes. Diameter 1 5/8". Antique Clichy. Open concentric millefiori on clear ground. Eight pink canes surround a central green cog cane. Outside row of alternating single turquoise and double white/pink star canes. Diameter 1 7/8". Antique Clichy. Millefiori scramble with pink rose cane. Diameter 2.65". Mid-19th century. Antique Clichy. 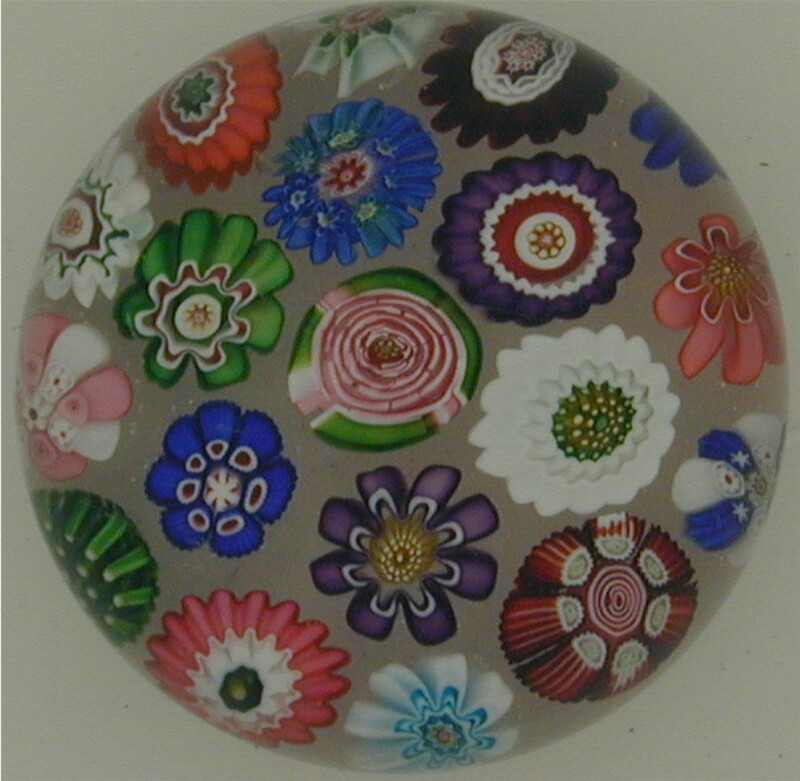 Millefiori scramble with pink rose cane visible on underside. Miniature. Mid-19th century. Antique Clichy. Sulphide of young Queen Victoria on clear ground. Unfaceted. Diameter 2 1/2". Antique St. Louis. 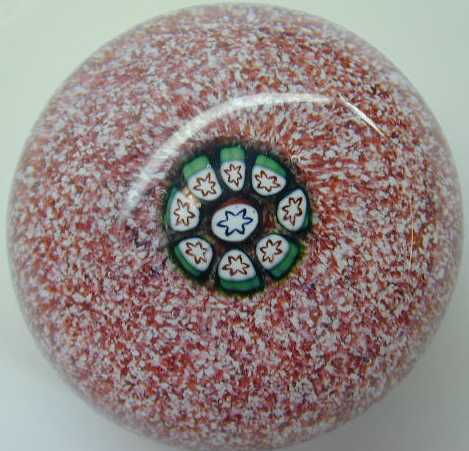 Complex central star cane on pink and white jasper ground. Miniature. Mid-19th century. Antique St. Louis. Millefiori scramble. Diameter 2 1/2". Antique St. Louis. Small nosegay with four flowers and five green leaves. Multi-faceted. Mid-19th century. Antique Baccarat, blue and white anemone with central stardust cane, two main leaves and stem with three smaller leaves. Mid-19th century. Antique Baccarat. Type 1 Pansy with central stardust cane and five leaves. Unfaceted. Diameter 2". Antique Baccarat. Type 1 Pansy with central stardust cane, ten leaves and bud. Starcut base. Unfaceted. Diameter 2 3/4". Antique Baccarat. Spaced millefiori on white upset muslin contains six silhouette canes (butterfly, deer, goat, dog, rooster) and a variety of six complex canes and twists of blue and white. Signature/date cane B1848. Diameter 2 1/2". Antique Baccarat. Seven circlets of complex canes each surrounding a central complex cane on a clear ground. Complex canes include arrowhead, bundled rods and stars. Diameter 2 3/4". Antique Baccarat. Concentric millefiori on clear ground. Mid-19th century. Antique French, probably Baccarat or St. Louis, ca. 1846-1860. Amber-stained base with an acid-etched picture of tethered horse in a paddock. No facetting. Antique French, probably Baccarat or St. Louis, ca. 1846-1860. Amber-stained with an acid-etched picture of stag. Five + one facetting. Antique Baccarat. Small 'rock' weight. 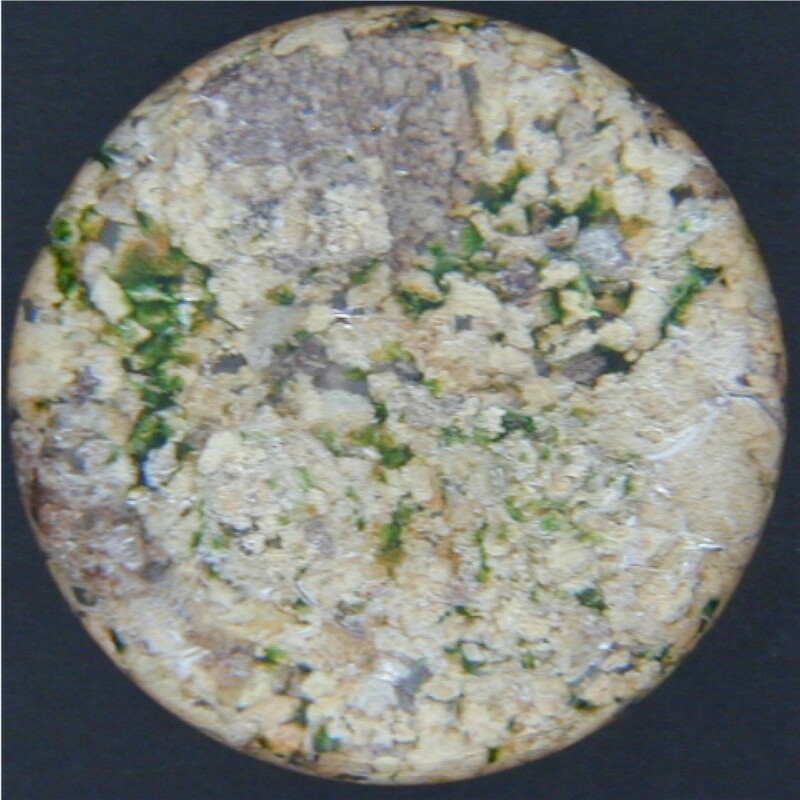 Sandy ground with flecks of green glass and mica. Circa 1880. Antique mantle ornament, 7 3/4"h x 2 13/16" w, spikes of dark blue, red, pale yellow, pink, white, green and aventurine. Antique, encased gold-coloured crucifix on green aventurine ground over white. Possibly attributed to French Meisenthal/Lorraine (?) or Belgium (?). Antique five-bubble stem weight with pink feathering around base. Possibly attributed to French Meisenthal/Lorraine (?) or Belgium (?). Modern St. Louis. 'Doily' weight, patterned millefiori on clear blue flash ground. Signature cane "SL 1972" visible from top. Diameter 3 1/8". Modern St. Louis. Sulphide of Queen Elizabeth II surrounded by a single row of concentric millefiori canes on cobalt blue ground. Five + one facetting. This weight was made to commemorate the 1953 coronation of Her Majesty Queen Elizabeth II. Modern Baccarat. 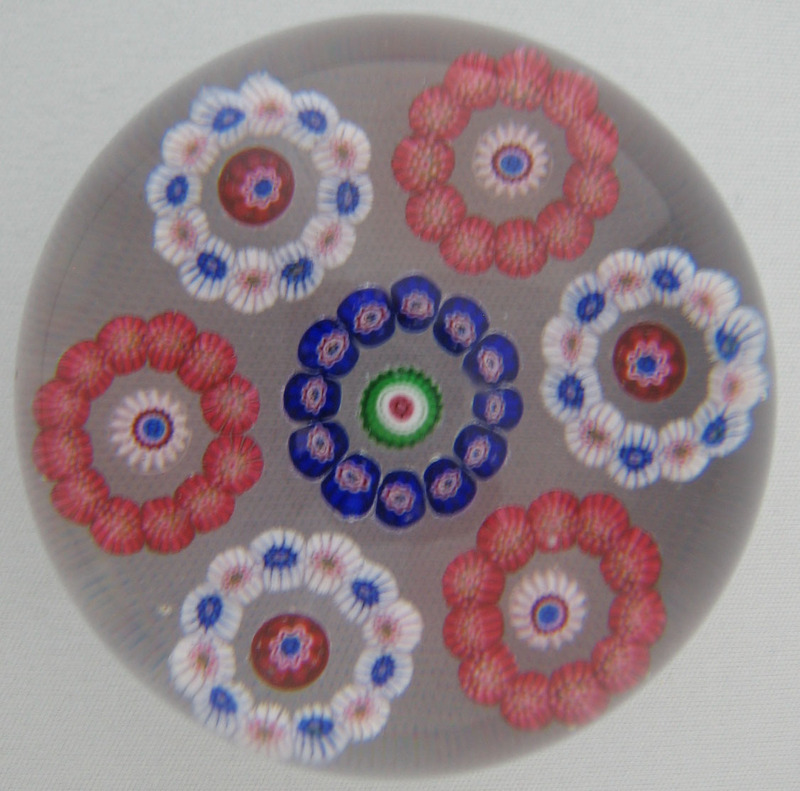 Five-row clear concentric millefiori. Acid etched logo 'Baccarat France' on base. Modern Baccarat. Spaced millefiori on white muslin. Signature cane "B1973". Modern Baccarat. Sulphide, Queen Elizabeth I, clear amber, top and six side printies, star cutting on base, The Franklin Mint 1976 and acid etched Baccarat logo on base. Modern Baccarat. 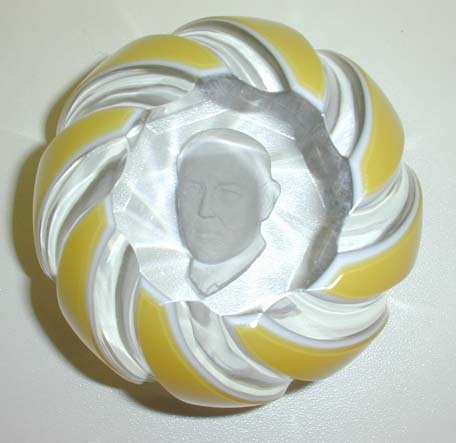 Sulphide, Woodrow Wilson, double overlay, yellow on white, diamond cutting on base, swirl cut sides, acid etched logo Baccarat France on base (M. Renard 1972). Modern Baccarat. Sulphide, Adlai Stevenson, amethyst on clear back, special cutting, acid etched logo on base (A. David 1969). Modern Baccarat. Sulphide, Evangeline Bergstrom, white sulphide on amethyst, five side facets and one top facet (1973). Modern Baccarat/Franklin Mint. Sulphide, Winston Churchill, white sulphide on blue, round with side and top windows (1976). 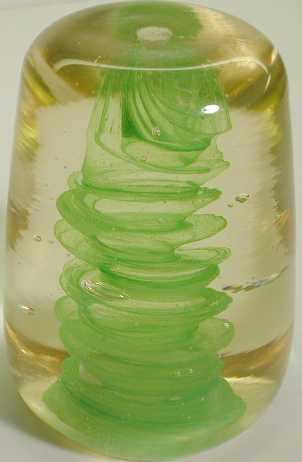 Large green swirl. Signed 'Schneider, France'. Les Verreries de Bréhat. 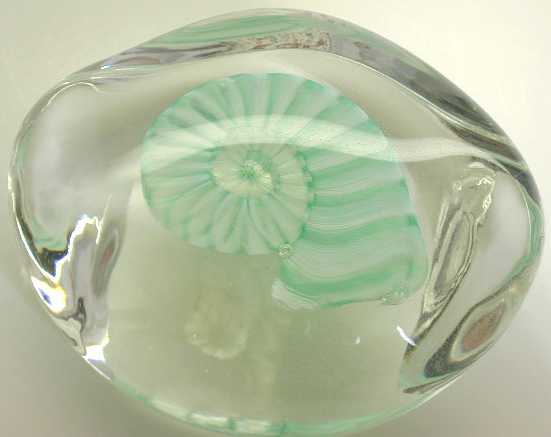 Modern form,"Nautilus". Signed 'Julie-Ann Johnson'.